Every time I look at my hair, there are a few more gray strands. When I smile, there are a few more wrinkles at the corners of my eyes. It seems like it hasn’t been that long ago since I graduated from high school, but when I actually stop to think about it, my graduation was quite a while ago. Not everyone had computers, no one had cell phones, and boyfriends were still making mixed tapes for their girlfriends. My parents gave me an electric Smith-Corona typewriter to take with me to college, and I loved that typewriter. I typed out many papers on that trusty typewriter. It even had auto-correct! About the same time I was typing out papers, Ed began working at the company he still works for. He’s worked there for 25 years, and we had a little celebration for him last week. The girls bought their Daddy a balloon and I made tacos for dinner. Taco night is Ed’s favorite! Those pesky numbers: our ages, our high school reunion years, our number of years working, make us feel old. Our two little girls, however, keep Ed and me young. Their favorite toys are still their stuffed animals. They love watching My Little Pony and singing to the Frozen soundtrack. Tonight, they begged me to take them to the park, even though it was only 50 degrees outside. Brr! They have an enthusiasm that is contagious, even in chilly weather. They make me do things that I might not otherwise do at the old age of 45. Going down the slide? Check! Swinging on the swingset? Check! Rollerblading at the roller rink? Check! A friend of mine (a younger friend, I might add) tells me that my age is just a number. Right now, at this age, I am the happiest that I’ve ever been. I have a happy marriage, I have two beautiful children who are becoming self-sufficient and yet still love to snuggle, and I have a job that I love. 45 is a good age to be. Do you feel your age? Link up your posts here, and be sure to visit my co-host Gretchen to read her thoughts on aging! My gray hairs get plucked or colored. Love Lady Clairol. I would add to your happiness list, health. Emmy has a great attitude. And congrats on Ed’s 25 years with the company. That’s great! This is a lovely post. I have been thinking of age lately and it just seems to go so fast. And then I see something I like and turn back to being childlike again. So, yes, I do agree that age is just a number (and yes, I am younger than you, but only by 2 years so it doesn’t really count). That Emmy is a smart girl! Those who truly love you do so because of who you are, not because of your age or your looks or anything else that’s temporal. Angelina Costenaro recently posted…Reclaiming Rome? 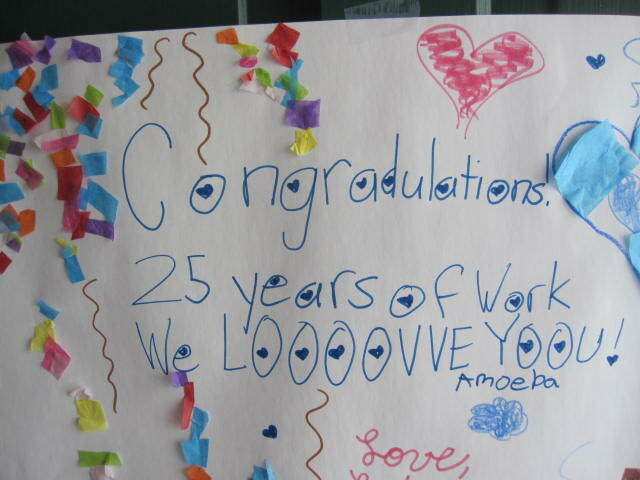 Wow – 25 years with the company is great!! And, I agree – age is just a number!! The mid-40s have been pretty great so far! Kim recently posted…Friday Deserves Some Laughs! Someone at work asked if I was ready for another 25 years. We’ll see! Love you post for aging. Loving where we are in time and space is a big part of positive aging. Hope you have a great weekend. And congrats to Ed for 25 years! A smith corona! I had one too. LOVED that typewriter. I was excited to have something new and all to myself. What beautiful reasons you have for keeping you young. Sweet family, girl. You are blessed! Congrats to Ed on being with his company for 25 years. In this day and age people job hop a lot, myself included. You’re right, age is a just a number. I try to live like that everyday. I sometimes think I’ll start to look BETTER as I age – like as if my gray hairs are just flukes and they’ll reverse to black. And as if my face will look more dewy. I think it’s my hopeless dreaming nature. tamaralikecamera recently posted…The One With the Inspiration. Janine Huldie recently posted…Fishing for Nice Compliments & Blushing, Too!